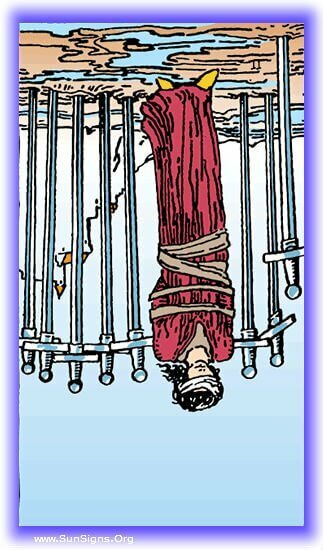 The Eight of Swords represents a sort of self-imposed imprisonment. The problem with this intellectual aspect of the Minor Arcana, is when it goes wild it can leave us locked in. \Too much thinking about a situation binds us in the indecision of our own thoughts, and convinces us that no action is the right one. This tarot card often leaves us filled with an immense sense of hopelessness. The Eight of Swords represents imprisonment, often self-imposed. 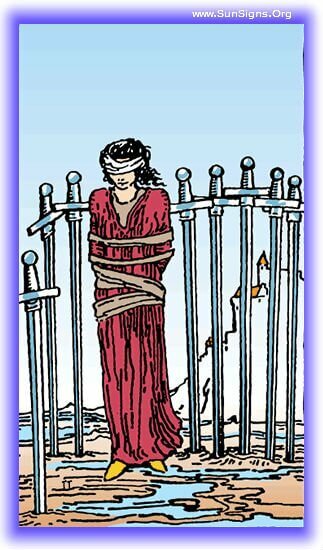 When this tarot card shows up it indicates that we have surrendered our power to another, and are waiting to be rescued. We have given up our agency to another, and this card warns us that it’s time to take it back. Often we don’t realize that our predicament is the result of our own decision. Fear and uncertainty have had your hands bound for so long, you don’t know how to break yourself free. You’ve given your freedom over, waiting for someone to set you free, and no one is going to. Your current circumstances are the result of you not taking responsibility for your situation. It’s time for that to change. You’re finding yourself hesitant to act, feeling like you can’t make a proper decision. Someone else is far better suited is what you think. Break this now before it cements you into place. The imprisonment you’re feeling is your own doing, and so is taking the option of your freedom. You have to take careful steps forward at this time. Your mindset at the moment is going to lead you right into a self-built trap. It will be incredibly difficult for you to break yourself free of it. You haven’t seen it coming yet, but it will be the result of an action you will take that makes perfect sense. But it will fill you with guilt when you see the results. Don’t let that guilt set on you, you made the right choice! The Eight of Swords reversed represents a liberation of mind and spirit. In response to the challenges you have faced your mind has opened to all the possibilities ahead of you. This represents a period of growth and expansion of self, and the recognition of the options that are open to you. When the Eight of Swords appears in your past, it represents having passed through a period of growth. You’ve been free and open in your experiences, and have shed the past from you like an old chrysalis that no longer fits the person you’ve become. You are at the beginning of a new chapter in your life, having cast off your chains. You are now ready to accept your options and make the changes that have always been available to you. The hesitation and fear you once lived under are gone, and your perspective has broadened to include all possible paths. You are on the brink of an epiphany. The challenges you now face are serving as fertilizer for the soil of your mind and self, and in the near future it will blossom into a garden of self-realization.